Club's first woman president says, "Giving back is as important as brushing your teeth." 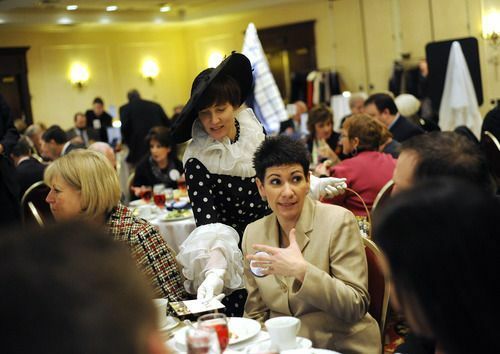 Sarah A. Miller | The Salt Lake Tribune Wearing a dress and hat that would have been popular when the Rotary Club of Salt Lake City was founded in 1911, board member Pearl Wright hands information to fellow Rotarian Suzanne Mulet during Club 24's 100th anniversary luncheon Tuesday at the Downtown Marriott hotel. 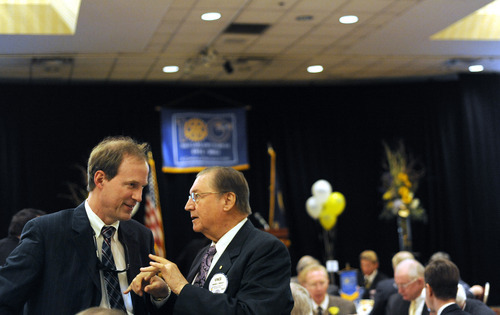 Sarah A. Miller | The Salt Lake Tribune Rotarians Tom Thatcher and Vince Breglio socialize during a Tuesday luncheon celebrating the Rotary Club of Salt Lake City's 100th anniversary. The club has promoted numerous civic-enhancement projects over the past century, from road building to the eradication of polio. When it came to celebrating its 100th birthday Tuesday, the Salt Lake City Rotary Club was anything but sedate. Skip Daynes, whose musical family has belonged to Rotary Club 24 for three generations, brought out a player piano that was built in 1911 and, with his feet rigorously working the pedals, cranked out that timeless classic, "You Are My Sunshine." Club president Jay Jacobsen donned a sharp black top hat for the affair, while Regan Sutalo wore a gown befitting "Rose" from Titanic lore. That legendary ocean liner sank to the bottom of the Atlantic a year after the Salt Lake club became Rotary's 24th club overall. The organization has 1.3 million members in 33,000 clubs worldwide and staged its 2007 international meeting in Salt Lake City. Jacobsen toasted the centennial birthday with a glass of champagne, joined by many in the crowd of 200 at the Marriott Downtown hotel. Retired music professor Ardean Watts pounded out "Happy Birthday" on a contemporary piano. Salt Lake City Mayor Ralph Becker was on hand to read a resolution proclaiming Tuesday Rotary Club Day, while Gov. Gary Herbert was represented by his chief of staff in declaring February "Rotary Club Month in Utah." U.S. Sen. Orrin Hatch also sent a letter of commendation. A barbershop quintet, the Crimson Five, received a rousing ovation after singing the University of Utah's fight song, "A Utah Man Am I" (there was no rendition of BYU's "Rise and Shout"). Member Thelma Iker also generated applause for making it out of protest-ravaged Egypt on Monday. And, in keeping with the light-hearted nature of the whole affair, several members received awards: Worst jokes of the past century, a tie between Mike Deputy and Glen Lambert; best sleeper through meetings, Wally Bennett; and best short tie, Duane Hill. More serious plaudits were given to members who have belonged to Club 24 for a good portion of this past century, led by one-time sporting-goods store owner Verner Zinik, a 58-year veteran. The occasion was memorable for Vicky Pembroke Davison, who became Club 24's first woman president in 2000-01. In doing so, she became the third member of the Pembroke family to hold the title of club president, following her great-grandfather, Adrian B. (1932), and grandfather, Adrian H. (1964). "My family sold us on Rotary early. I'm proud of my family's history here," she said, adding that the club's motto of "Service above self" resonates with the Pembrokes. "My family is serious about giving back to the community. Giving back is as important as brushing your teeth." That spirit of giving clearly stood out as one of Rotary's primary assets for 93-year-old Marvin Arent, who joined the club 44 years ago, when he was running his family business, Arent Ladies Fashion. He is particularly proud of the organization's fight against polio, a disease that crippled his mother-in-law, an aunt and his first boss. "It was very horrible," Arent said. But with help from Rotary, polio has been wiped out on all but three countries. "Rotary has been a wonderful thing for me," he said. "I've enjoyed all of my years in it." Life expectancy • 47 years. Cars • Only 8,000 in the U.S.
Average wage • 22 cents an hour. Births • Ninety-five percent occurred at home. Hair-washing • For most women, once a month. Taxes • Ninety-five percent of them didn't exist.